In recent weeks I’ve struggled for inspiration in many areas. It happens to everyone at times but when it’s you it seems much more concerning. When you get in that place you have to first recognize you are there. Sometimes that takes awhile for me. Little by little I realize my reality show viewing has skyrocketed and my time spent in my cozy art shack has dwindled and there is actual dust on things–ack! I haven’t blogged in weeks and my camera sits untouched and forlorn and still hooked to my computer from the upload of long ago–well okay–a few weeks ago. Still it is pathetic. Once I realize my plight I have to address it. Step One: I pick up some books at the library–a novel and a couple of memoirs. Memoirs always seem to jumpstart my psyche and inspire me. For some reason I often gravitate toward heroic mountain climbing stories of Everest or Rainier or others. I have zero desire to ever actually climb a mountain but I feel empowered by reading stories of others who have done it. Step Two: Pull old books and magazines off the shelf that I haven’t looked at in awhile–lord knows I have enough to revisit! Past issues of Cloth Paper Scissors, Bead and Button, Art Journaling, Artful Blogging–you get the picture. I even pulled out a book by one of my past favs on television–Christopher Lowell–the designer decorator. After spending a few days browsing and immersing myself in all the colors and ideas and accomplishments of others I feel some creative juices started to bubble–or is it all the football food I’ve eaten recently? No, no–it’s definitely a creative bubble! Step Three: Actually enter the art shack. Part of the problem is that I have made a mess of things in there. What started out as pleasingly organized has devolved into semi-controlled chaos. I use that term loosely. My space is small (8’x12′) and there is little room for haphazard stacking and piling. I sweep the floor and pick things up to put away and that gets the ball rolling. Soon I am putting things back in their place and sorting finished items from partially finished items. I admit a few spiders had to die during this process. I realized my inspiration was back. I could not wait to make something! What a flush of joyous energy. My bead collection looked more sparkly and more shiny than I remembered and I’m sure they multiplied since the last time I played with them. Or maybe I had forgotten my last bead-addiction fueled shopping excursion at my favorite local bead store (Alley Cat Beads). 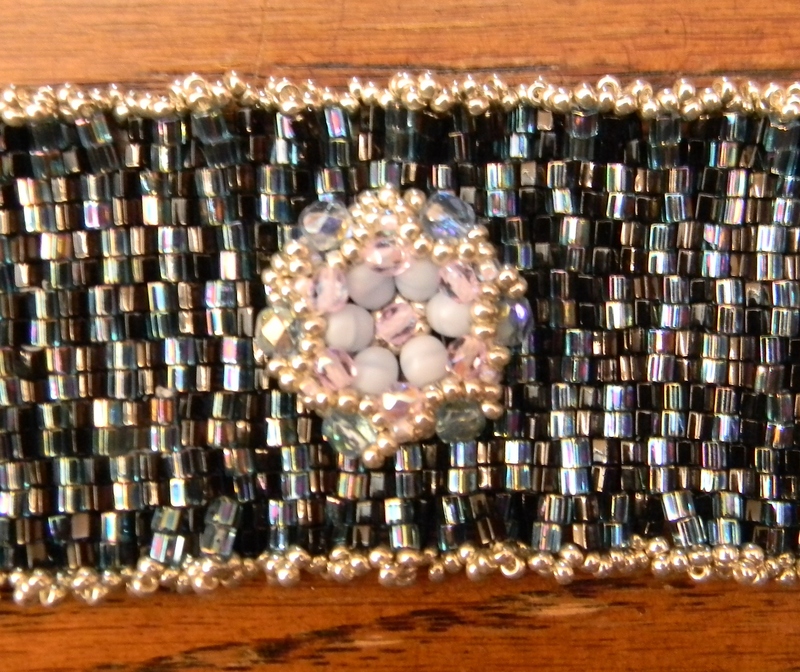 Embarking on a beadweaving frenzy on my diningroom table (no cold turkey for me–I had to wean off my reality tv favs) I started to get back on my creative path. The first thing I did was finish this cuff I started many months ago. I’ve now finished three more! I spent a lot of time happily ensconced in my art shack this weekend playing with paper and paint and ink. It feels so good to be unstuck! Inspiration is a beautiful thang! Thanks for the inspiration that you have given me! Your bracelets look GREAT!